This has hung in 5 different homes of mine over the years, including my current apartment. I’ve long been fascinated with public art created for FDR’s Works Progress Administration in the 1930s. You can view WPA artwork in public places all over the country including Diego Rivera’s murals in San Francisco’s Coit Tower. A common theme in WPA is a glorification of the dignity of the working man, as in this case. The artist, Earle Wilton Richardson, would have been 100 years old this year. He was only 22 when commissioned by the WPA. 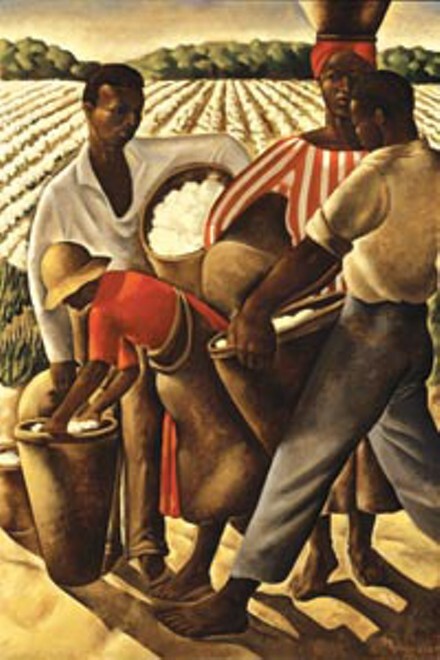 Originally he and fellow African-American artist Malvin Gray Johnson (who has a much more extensive catalogue of WPA art) were to do a larger, Diego Rivera-style mural at New York Public Library’s 135th street branch. However, Johnson died unexpectedly of illness in late 1934. They were a couple and severe depression over his partner’s death led Richardson to suicide in early 1935. It’s important to remember how much of our culture was improved by stimulus spending under Roosevelt, from arts to infrastructure. It’s really sad to see it replaced by today’s “I’ve got mine” mentality. Hi, Jason. Glad to discover your post on Richardson. Are you also attributing the second image on this page to ER as well? Doesn’t look like Rivera’s nor I don’t recall seeing it at Coit Tower. Where is this work? Hi Jacqueline! I don’t know where it is, but I’ll do some digging. I just found it when perusing some WPA artwork from the 1930s online! Hi Jacqueline! No, that was a painting I found when just doing a search of WPA art from the same time period. It’s definitely not Richardson or Rivera. I’ll do some digging later and see if I can find the artist! !